You might think an ergonomic Herman Miller chair and a perfectly positioned desk would make for the ideal home workspace. But you've been lied to. 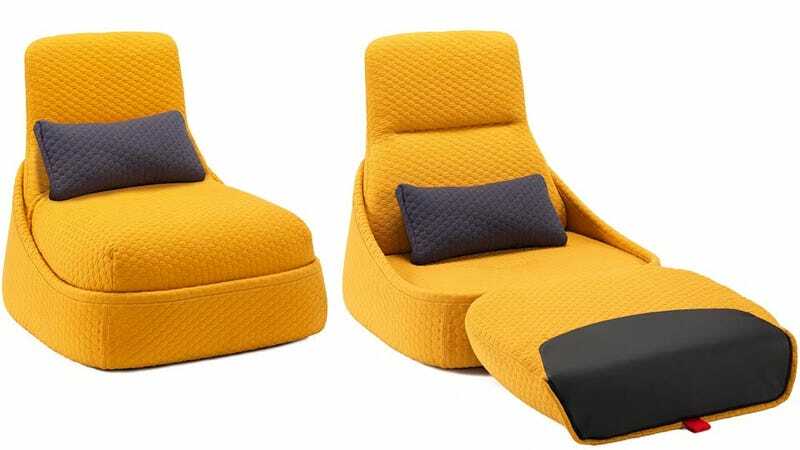 When you have the luxury of working from home you're gonna want to put your feet up, and Coalesse's forthcoming Hosu lounger lets you do just that. It easily transformers from a chair to a lounger by just flipping over a hinged cushion, and pockets located on the sides and back mean you don't need to waste money on a filing cabinet when outfitting your home office. The Hosu also seems to be the first seating solution that acknowledges the existence of charging cables, and so provides strategically placed channels to tuck them away so they're not just hanging all over the place. There's no pricing info just yet, but come the fall you'll be able to get it in 36 or 64-inch wide styles, in one of six fabric colors.